So did you know that this is National Ag Week? Well it is, or so says the Agricultural Council of America (ACA). The ACA is made up of leaders in agriculture working to promote public awareness of agriculture’s vital role in society. Especially for people who think food grows in grocery stores. Tuesday was Ag Day, and our wonderful Customer Service team made a poster with nice things said about the NCRS staff from AgroLiquid employees. And today, Margie brought out balloons and pizza. Looks like we had over 100% attendance today. Thanks! Here is some of the snow that remains. Hopefully it will be gone by Monday and start warming up. It was nice and warm in the greenhouse where Chris, Zouheir and I worked on a grow-out experiment on soybeans. Zouheir made these buckets and added the test soil. Chris accurately applied the test fertilizers. As usual I took pictures. But they did let me plant the soybeans. So our first crop is in! As the countdown to planting ticks ever closer, there is always the final touch-ups on the planters. Tim and Phil attach some new prototype fertilizer application devices to our plot planter. Why is it green and going on our blue planter? Hmmmm. Quinten, who works here between classes at MSU during the school year, carefully assembles the new applicators. Always fun to try something new. So everyone was busy today….and that’s just the stuff that I took pictures of. (I mean….the stuff of which I took pictures.) Enjoy the rest of Ag Week. It continues through Saturday. So who says there’s no such thing as a free lunch? Well there is at the NCRS on Thursday. With all of the rain taking place of late, why not throw an open house! So the NCRS crew has our equipment set up, tables of product information, NCRS history and results, soil test and product needs, videos, and who know what else. Plus hamburgers and hotdogs. Local growers as well as not so local growers are invited. But to reach and even larger audience, the blog has stepped in. And I see there are door prizes! So stop by. The lunch is free. And if you want to get some AgroLiquid for your farm….well that’s not free. But it pays back much more than it costs. Research proven after all. So we got a new planter a few weeks ago. A Kinze 3500 with 15″ Interplant system. Some assembly required. Quinten, Tim, Phil and Ron discuss what comes next. The Monosem served us well for over ten years, but time for an upgrade. Whether it’s 6 rows or 11 rows, this big vacuum fan ought to do the job. It’s huge. Ron built a tank holder frame, with another one on the way. It’s also getting some Precision Planting attachments. So it should be ready when planting begins in a few weeks. Anyone could order a planter in the fall and take all winter working on it. But we like to stay fresh with short deadline driven accuracy. Last week Phil started topdressing some wheat. It’s rare that fields are dried out enough to get on this early. Say, wasn’t I just with JW in California? He must have followed me home. But while here he gave some pruning tips in the orchard. JW is an apple pruner from way back. Tim B, Jay and Renae discuss the finer points of pruning. The orchard is pretty much done as it’s that time of year. But just a few more well-placed snips. Snip snip here. Snip snip there. And a couple of tra la la’s. (Come on, everybody knows that song.) Thanks for the pointers JW. Well the days are getting longer and warmer as well. Although still chilly. But we’re getting that itchy feeling that planting season is getting close. At least I hope that’s what it is. So we have had a warm stretch of weather lately and so it is still nice to get outside and see what is going on at the NCRS. These pics are from last Friday. Field crop harvest is over and all that remains of some of the corn plots is the unharvested plot border rows. This is from Farm 11 where the plots are over a thousand feet long. Here are the sugarbeets from the experiment on Farm 7. We have a deal with a nearby grower who uses one of those Maus harvesters that scoops them up and unloads into a truck on the road. I showed that in the blog a few years ago. It’s cool. They will get over here someday soon. I hate to admit that we have a constant battle with compaction. This is because all of our six row plots have numerous trips through all season from planting, sidedress (corn), foliar apps, harvest and grain cart weigh wagon. So we are on a ripping rotation and use cover crops where we can. Here we see Phil operating the ripper on Farm 10. There is still some of what we call “production corn” out. This is corn that was not part of a replicated plot experiment. Here is Jeff over on Farm 9 trying to finish up. There are some evaluations taking place in the greenhouse. This is a tomato fertilizer test for greenhouse grown tomato transplants. These are some of the plants kept after the earlier evaluations. On the left is no fertilizer, in the middle is AgroLiquid Grow Right and on the right is a commercially used dry fertilizer (dissolved in water for use). The best treatment is obvious to me. Over on Farm 5 there is an experiment with rows of emerging winter wheat. The wheat went in a little late this fall as harvest was held up several times due to rain. But with the warm days now it is growing fast. And here is the high density orchard. See the white trunks? That is a paint that will reflect the intense light that is reflected by snow, that will surely be here sometime in the months ahead. Left unprotected, the trees can develop cracks in the bark. Unfortunately with over 3000 trees in this orchard, there is still a ways to go. But it will get done. So the 23rd season of research is wrapping up at our North Central Research Station. But don’t worry, we saved some more things to test in 2017. So, again, sorry for the lapse in blog posts, but I’ve been busy. 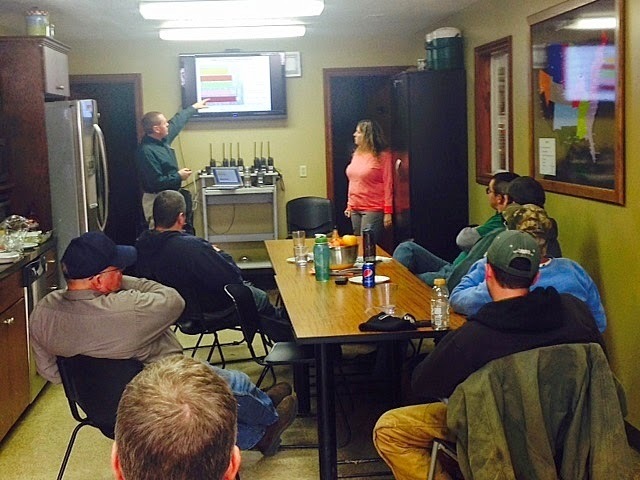 But over the past three weeks, the Sales Account Managers and Regional Managers have been attending training and business sessions at AgroLiquid World Headquarters here in St. Johns, Michigan. They spaced them over three weeks so the group size would be more manageable, I guess. But what training session would be complete without a visit to the North Central Research Station? Well, it would be pretty poor. So here are some pics of what went on. The day was filled with activities planned by the NCRS Research Managers Tim, Stephanie and Jacob with ample support by the NCRS staff as well as the Agronomy Staff. Dr. Zouheir Masri demonstrated how he extracts plant-usable soil phosphorus at different depths so as to compare different fertilizers for the ability to feed plants over time. 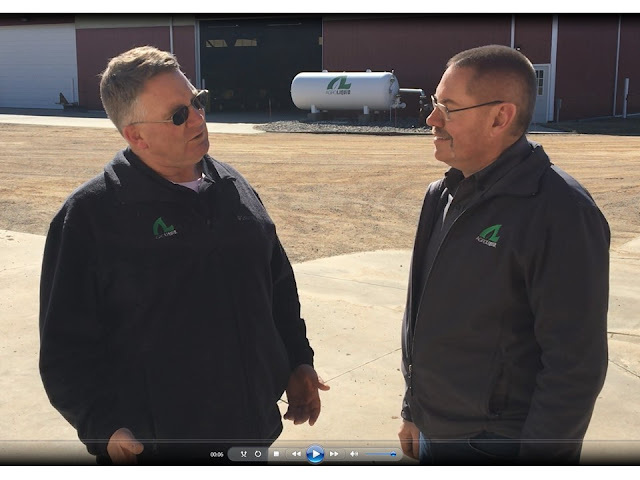 Tim and SAM Brian discuss efficacy of different types of seed-firmers for in-furrow fertilizer application. Here was a fun time. Tim planted 6 rows of corn, but some of the rows had an issue, such as too shallow, too deep, doubles, population too high or too low, and one was just right. So their mission, should they decide to accept it, was to find the seeds and diagnose the issue. Tim demonstrated the different types of nozzles used for sprayer application, and when to use which one for the different application goals. He also showed how the Hagie sprayer can make sidedress applications with coulter or Y-Drops. Stephanie talked about field checking corn. Like growth stage, stand counts and growing conditions. Horticulturist Jacob goes over the basics of setting vegetable transplants into a plastic mulch, including fertilizer application. It wasn’t just watching, as Bruce and Eric found out. You need fast hands for this. Don’t quit your day job Bruce. The NCRS orchard has plenty of learning opportunities, as Jacob explains. AgroLiquid has all of the essential nutrients for top apple production, and all are on display here. There are also some test applicators in the overhead hose lines that are being tested and developed here. Cutting edge stuff. So that was just a snap-shot of all that went on. But the SAM’s all left with increased knowledge for supporting AgroLiquid. Also, there are a number of NCRS tours lined up culminating with THE Agro-Expo on August 16-18. Want to see some of this for your own self? Well show up then. LIVE FROM THE NCRS: Unleash the Planters! So it’s not the early start that we were hoping for, but at long last planting started today at the NCRS. The weather was still cold (40’s) and cloudy most of the day, but soil conditions were good for sugarbeet planting. Below we see Tim and Stephanie conferring at the fertilizer “War Wagon”. The wagon received an update of more tanks and look at the labels on all of the valves. Quite an array of Liquid on tap. Tim guides the planter through the randomized plot layout here on Farm 7. I guess hands are considered planters in the case of Tim B and Jacob setting transplant onions on Farm 12. There are two rows per bed, and the Liquid fertilizer is banded several inches under the sets. These are a new type of onion for the NCRS, and will grow to be giant bulbs. They are using a piece of drip tape with marks to indicate where to push in the transplant. Good plan. And so it begins. Soon all of that vacant ground will have growing plants, with many enjoying a season of invigorating Liquid nutrition. (Well some have to suffer with inferior Brand X for comparison.) Makes me want to grab a drink. So yesterday at the NCRS there was a research presentation for the staff there. Now that the research report is complete, all of the support staff was anxious to see how the summer of work turned out. So in order to get everyone there, including me, there was a great lunch. Stephanie made some potato and ham soup. There was bread and salad and a cake. So naturally after eating that, everyone was ready to see the results. Tim and Stephanie covered the field crops. 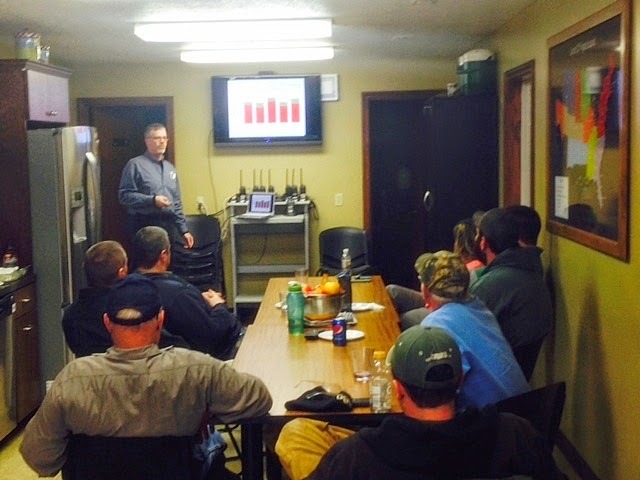 And Brian went over the specialty crop results. It was important to present it this way to the group so that we can all discuss it and see what needs to be done the next season. Which will probably be here before we know it. 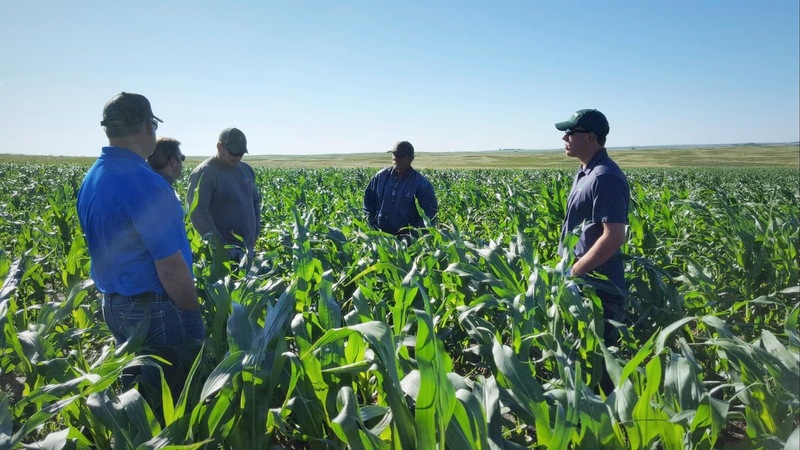 On the heels of twenty years in operation, the largest plant nutrition research farm in the country welcomed growers and ag retailers to its annual field days late last month. The North Central Research Station, located just north of St. Johns, Mich., boasts more than 750 tillable acres of crop research in crops ranging widely from corn and soybeans to apples and zucchini. During staggered tours, each spanning nearly five hours, attendees rotated through classroom-style sessions at AgroLiquid headquarters, demo farm stops and field tours through corn, soybean, sugar beet and intensive apple orchard production sites. Results from both AgroLiquid and conventional treatment plans were on display throughout the tour. At demo farm stops attendees were encouraged to walk rows, pull up plants and even taste produce — watermelons, specifically — produced with AgroLiquid’s enhanced efficiency liquid fertilizers. One of the newest additions to the North Central Research Station, an intensive orchard planted in high-density with apple trees and headed up by Senior Horticulture Research Manager Dr. Brian Levene captured the interest of most attendees and spurred many questions. 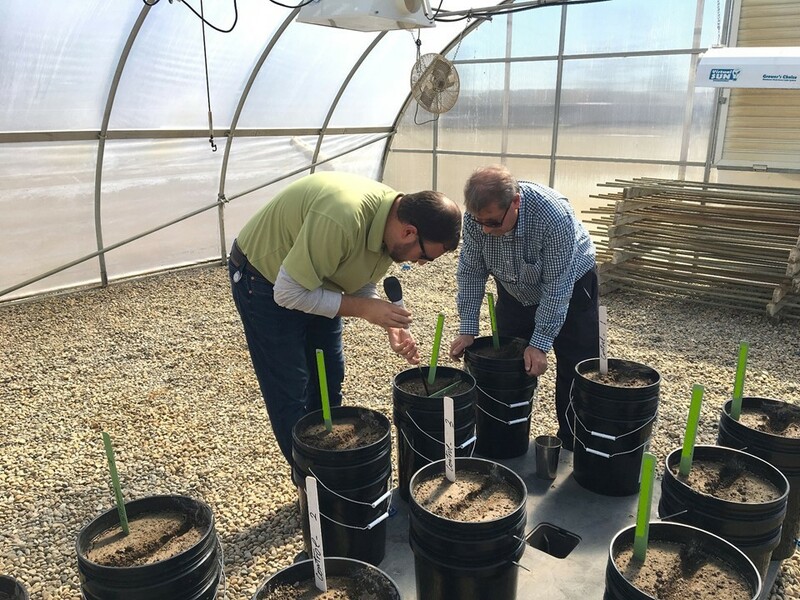 With more than 1,000 trees expected to be in production next year, returning attendees will no doubt be interested to see the results at 2015 Field Day events. In addition to the research results and demonstrations presented, sponsoring exhibitors such as AgXcel, John Deere Credit, No-Till Farmer Magazine, Greenstone Farm Credit Services, Enduraplas and others were on hand in the AgroLiquid HQ concourse, giving attendees plenty of chances for networking and exploring new options for improving their production practices in 2015. Boxed lunches, snacks and AgroLiquid CEO Troy Bancroft’s homemade ice cream were on offer during and after tours, keeping attendees happy and well-fed throughout. Attendees were also welcome to take a tour of AgroLiquid’s new IQhub. Slated for its grand opening September 12, 2014 at 2:00 pm, the IQhub is a 9,500 square-foot home to agricultural history, innovation and exploration. Housing 23 museum-quality exhibits, each exploring agriculture from the time of the pilgrims in America through the present day, the IQhub promises fun for both the young and young-at-heart. 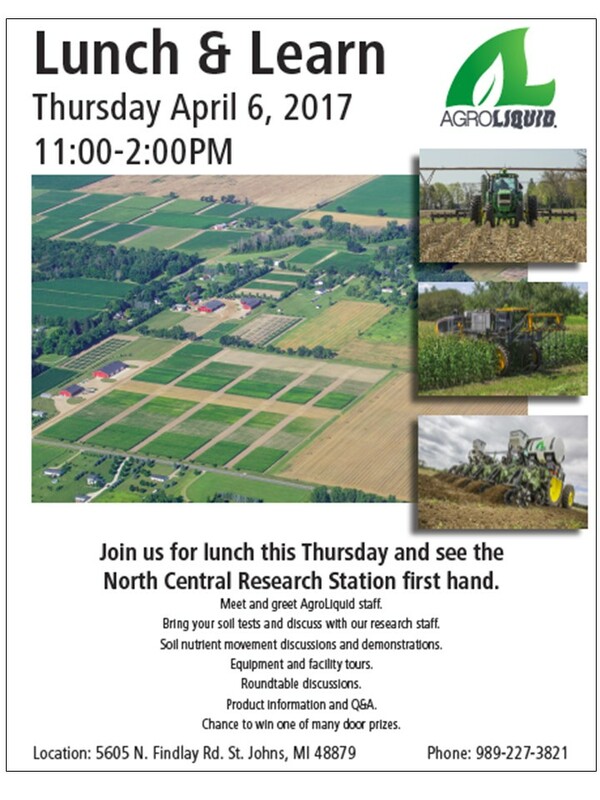 If you missed the 2014 field day events, be sure to sign up for the AgroLiquid newsletter to be notified of upcoming events before next year.